5 world premieres (all are LA Phil commissions): Peter Lieberson’s Shing Kham, Magnus Lindberg’s Cello Concerto No. 2, Daníel Bjarnason’s Blow bright, Terry Riley’s new organ concerto At the Royal Majestic, and Andrew Norman’s Release for piano and orchestra. Seven of the 13 concerts are conducted by the LA Phil’s Music Director, Gustavo Dudamel, now in his fifth season. 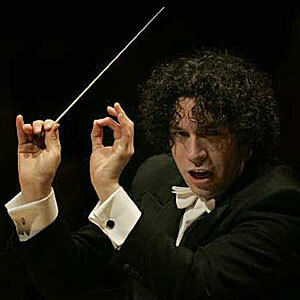 This gives audiences the opportunity to hear the many different facets of Dudamel’s artistry. Two concerts conducted by the LA Phil’s Conductor Laureate, Esa-Pekka Salonen, including a return to WDCH of Salonen’s Grawemeyer Award-winning Violin Concerto, which was premiered on Salonen’s final concerts as LA Phil Music Director, and which is a farewell letter to the orchestra. The concert featuring the Corigliano Symphony No. 1 was a late addition to this season’s schedule, and after hearing the LA Phil perform this incredible work in Boston last weekend, I’m so happy we added it at the last minute. Great pianists galore! Yefim Bronfman, Yuja Wang, Jean-Yves Thibaudet, Garrick Ohlsson, Emanuel Ax, Lang Lang, and Hélène Grimaud. Plus: Leila Josefowicz, John Adams, James Conlon, Cameron Carpenter, and a cellist who has given the world premieres of 25 (!) concertos, Anssi Karttunen. Approx 34,000 people tune in each week for KUSC’s local broadcasts of the LA Phil. Or about 15 Walt Disney Concert Hall’s worth. Total audience size for KUSC’s 13 local broadcasts of LA Phil concerts equals nearly eight Dodger Stadiums at capacity. This will be my seventh season hosting or co-hosting the LA Phil radio broadcasts. It is the first time during my tenure that Sibelius’ 5th Symphony appears on the series. Just a coincidence, nothing more. Sundays at 7:00 p.m. on Classical KUSC. Each performance will be archived for on-demand streaming for one week following the broadcast at KUSC.org/LAPhil.